OHANA is a true example of the quality of Heesen Shipyard. 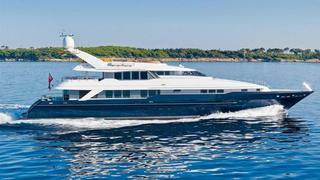 This 44 meter / 143 ft semi displacement yacht has a max speed of 22 knots and a cruising speed of 12-16 knots. With 5 comfortable staterooms, OHANA accommodates 10 guests. She also sports a large main saloon, a sky lounge and generous deck areas with alfresco dining on the aft bridge deck and sunbathing, lounging and a jacuzzi on the flybridge deck.